Talk about a story line (you realize this means there is going to be another season of Basketball Wives: LA, right?)! Of course, she has to actually be on the show to have a story line, and that’s up in the air for this multi-tasking diva! Draya Michele has just announced that she is expecting a baby with Orlando Scandrick, her fiancé. I remember when the two announced their engagement as last season of BBWLA aired. Am I the only one who missed that these two got back together after a very public break-up? Apparently yes…and I work here. Yo-yo relationship, anyone? While the thirty-year-old reality star is already a mom to thirteen-year-old son Kniko, this with be Draya’s first child with the Dallas Cowboys cornerback. Orlando is the father to six-year-old twins Tatiana and Taylor from a previous relationship. Draya recently shared that the couple will be welcoming a son in late April evening out the sibling dynamic. Congratulations to the happy couple! 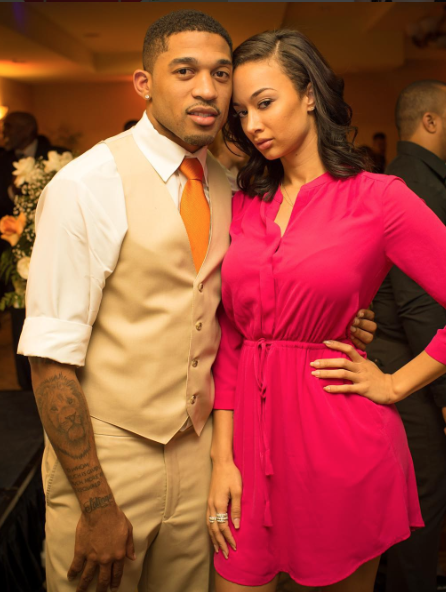 Draya Michele And Orlando Scandrick Re-Engaged Again; Draya Confirms Basketball Wives: LA Exit? If you can’t make it down the aisle how the hell are you gonna make it until forever? I guess those details don’t concern Draya Michele or Orlando Scandrick and their revolving door of an on-and-off-engagement! The Basketball Wives LA star has made no secret that she loves her Orlando, after breaking up for a couple months, he finally popped the question in June. Then they then called things off in July, but come August Draya’s ring is back in place and blinging the answer to the question about whether or not they’ve called it quits. This week's reality TV viewer numbers are in – and an impressive 2.206 million watched the Basketball Wives L.A. reunion, bringing its season average to 2.055 million. Sadly, only 861,000 fans bothered with the Southern Charm reunion, but we hope the season finale's 1.21 million and the season average of 943,000 is enough to get it renewed. Part two of the controversial Real Housewives of Atlanta reunion attracted 4.148 million viewers – that's a tiny bump up from part one. Roughly half of RHOA's audience stuck around to watch Cecil and Dr. Simone's marital woes on Married to Medicine. The Ramona and Sonja drama on Real Housewives of New York interested 1.464 million viewers, which is a new season six high. Meanwhile, 1.711 million suffered through "fakes giving" on Real Housewives of Orange County, and 1.136 million watched Millina's struggle on 16 and Pregnant. Viewer Numbers: Real Housewives Of Atlanta Reunion, Married To Medicine, Southern Charm, And More! The reality TV viewer numbers are in – and it's good news all around. The Real Housewives of Atlanta kicked off their reunion with 4.13 million viewers in attendance. Also on Sunday, 2.38 million fans tuned in for the Quad vs. Mariah gossip on Married to Medicine. On Monday, season finales of Southern Charm and Basketball Wives L.A. garnered 1.21 million and 2.198 million, respectively. That's a season high for Southern Charm. 1.84 million watched the spooky party on Real Housewives of Orange County, and 1.21 million met Autumn on 16 and Pregnant. On Tuesday, 1.383 million viewers sat through the Real Housewives of New York bickering their way through July 4th. Part two of the Teen Mom 2 reunion attracted 1.351 million. That's a season low for Teen Mom 2. But it's more likely a result of MTV messing with the schedule rather than viewers losing interest. Reality TV Viewer Numbers: 16 and Pregnant, Real Housewives, Dance Moms, Southern Charm, Teen Mom 2, And More! The reality TV viewer numbers are in with two returning long-running shows on the list, 16 and Pregnant and Real Housewives of Orange County. 16 and Pregnant kicked off season five with 1.194 million viewers and RHOC's season nine premiere attracted 1.703 million fans. For comparison's sake, the most recent premieres of RHOBH and RHONY garnered 1.592 million and 1.329 million, respectively. Six weeks in, 1.259 million watched much ado about nothing on Real Housewives of New York this week. The season six finale of Real Housewives of Atlanta attracted 3.816 million fans, bringing its season average to 3.83 million. RHOA could finish season six with a four million average if the reunion shows do well – and that's likely considering the hoopla surrounding Kenya and Porsha.